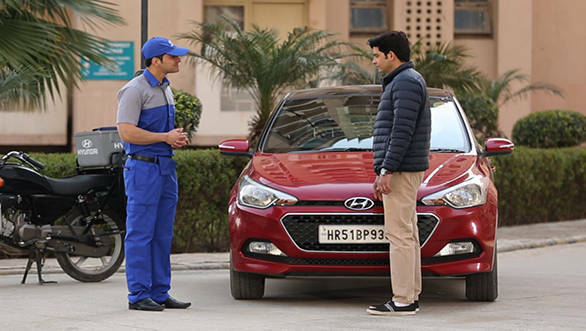 Hyundai Motor India Limited (HMIL) introduced a service programme called the 'Door-step Advantage'. The service programme covers periodic service, minor repairs, dry wash and car interior and exterior cleaning at the location of the customer's convenience i.e home or office. Hyundai has deployed a fleet of over 500 two-wheelers at more than 475 locations pan India to provide the service. The service can be booked and paid for online. Speaking about the success of this innovative initiative, S. Punnaivanam, VP - National Service, Hyundai Motor India Ltd. said, "Hyundai is a caring brand and as a lifetime partner and beyond, Hyundai has always emphasised on best service support for its customers. The Door-Step Advantage makes the entire service experience fast, seamless and hassle-free, strengthening customer trust." A similar programme was announced by Toyota earlier this week. By offering services on-call, budget car manufacturers are offering an experience to their customers which was exclusive to premium car manufacturers until some years ago. 'Door-step Advantage' aside, Hyundai, in the past has offered free PUC and a dry wash campaign. Hyundai claimed that the 'dry wash' saved 120 litres of water per car and the company then donated the amount of water saved to drought-affected areas.